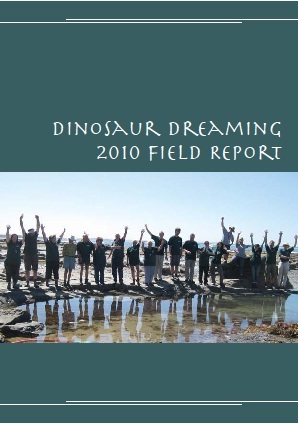 Dinosaur Dreaming is pleased to announce that our 2010 Field Report has been published. Friends and crew unable to attend the launch at the Museum last week should get theirs in the mail shortly. Not that I'm biased or anything, but I think it looks great. 56 pages and over 20 separate authors. Thanks to all contributors, to Alanna for layout, design and, well, making it all happen, and to Dave for letting us use his vollies for stapling and for giving us red wine and salty snacks when we really (really) needed them. Friends of Dinosaur Dreaming and Dinosaur Dreaming crew past and present are reminded that the Field Report Presentation is this Saturday and the Melbourne Museum. If you are not a Friend of Dinosaur Dreaming you can join at http://dinosaurdreaming.monash.edu/friends/index.html. This weekend, a small group of dinosaur dreamers gave the new Cape Paterson dig house a dry run. We were a little distracted by the old newspapers used for wrapping﻿ the rocks that we reprocessed. Gerry shows support from the sidelines. ﻿﻿The Field Report is coming along well.